Welcome to the Enjin API The Enjin Website API is a JSON-RPC service that exposes data from your website in JSON format for creating your own features and website integrations. The API is currently in beta and will be receiving several updates as we come out with them. This being said, please be sure to check this source for any new features or updates as often as possible. If you feel our API is lacking certain features, please feel free to send us suggestions here. 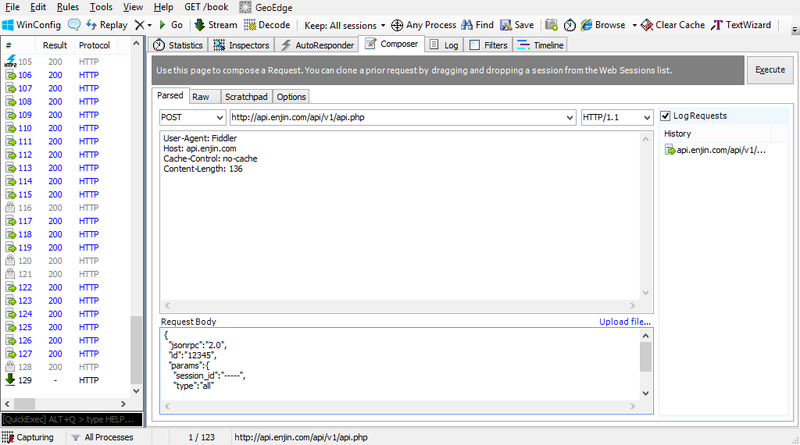 To retrieve data from our API, you'll be given a base URL, this is generally "yourwebsite.com/api/v1/api.php". To use SSL, make sure to use https:// instead of http:// (SSL is currently supported on *.enjin.com domains only). In addition to the full URL, some API calls require parameters and some of these parameters may be optional. Every possible parameter will be listed in each specific API section. Some API calls will require your secret API key. This is used to ensure the protection of sensitive data and prevent unknown users from executing certain actions (such as tagging or untagging a user). Your API key is only shown once when it is generated. Please write down the code and make sure your key is not being shared with other individuals. You can generate a new key if needed in your Admin Panel | Settings | API area. Finally, some API calls will also require a module ID, such as the shopping module. To learn where to find this information, please read this section. To get started, read over the following sections. After that, begin reading through some of the API calls. Enabling the API Making Requests Authentication Enabling Developer Mode Obtaining IDs Response Signature Have questions or suggestions? Send us a ticket. 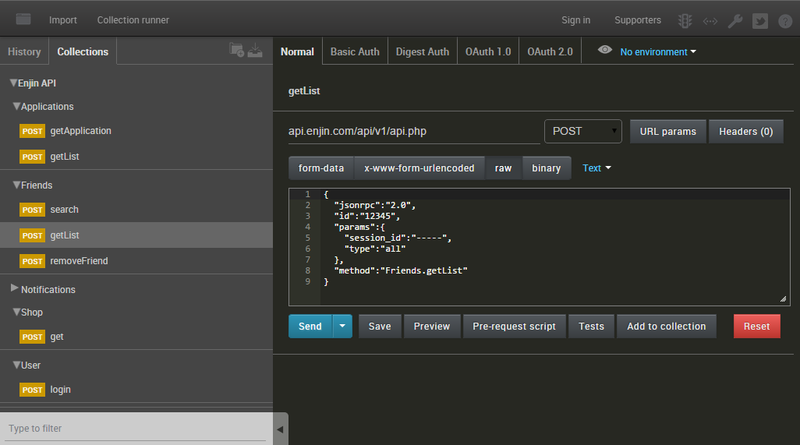 To enable your API, visit your admin panel / settings / API area. The content on this page includes your base API URL, your secret API key, and the API mode. Ensure that the API mode is set to "Public". The three API modes currently available are public, disabled, and read only. Using "Public" means that all API functions are active and the authentication methods can be used to retrieve or modify your website data. Usually, this means using your Secret API Key or being logged in to Enjin. Disabled means that the api is off entirely for anyone trying to access it. If the mode is set to "Read Only", the only calls to the API that will work are those that are not modifying data. For example, methods such as Points.get will work, but Points.set will not. Each API section will detail whether or not read-only is available. "method" is the name of the API class and method, for example "Friends.getList"
Postman is a user-friendly REST client you can use to test API calls. Note: If you are testing the User.login method, Postman will remember your login cookie. If you prefer to only send “clean” requests without cookies, consider using Fiddler (below) which does not store cookies. Fiddler is a free web debugging proxy Finally, you can use the Try It section under each method of this documentation to test your API requests. Fill in the fields and click “Send API Query!” to test any API method. Specify "api_key" in the request params. This uses the global Secret API Key or Custom API Key found in Admin - Settings - API. Specify "authkey" in the request params. This uses the Minecraft server key found in Admin - Minecraft - Servers. This method is useful if you are building Enjin extensions to your Minecraft server. Specify "session_id" in the request params. You can obtain a session_id by calling "User.login"
Session IDs will only last for a limited amount of time (typically 30 days, but this is not guaranteed) after which you need to call User.login again for a new Session ID. A session cookie will need to be present on the web browser / client - this means the user has to be logged in to Enjin on your domain. This API method can be accessed without any authentication or user login required. There are various methods that require you to specify an ID. This section will provide you with an easy way of obtaining the majority of those IDs. You will need to follow the section "Enabling Developer Mode" in order to view the additional information listed on this page. You can acquire the ID of a profile by navigating to the users wall and then selecting the "About Me" tab. From there, you can easily see the user ID associated with the individual. You can acquire the ID of a module by navigating to your website's administrator panel followed by selecting the "Modules" tab. You will see an additional column reading "Module ID" for each module on your website. You can acquire the ID of a tag by navigating to your website's administrator panel followed by selecting the "Users" tab. Simply edit any custom tag and the ID will be listed in the dialog's title. You can acquire the ID of a page by navigating to your website's administrator panel followed by selecting the "Pages" tab. You can either select the page and see the page ID in the information box at the top of the editor or you can select the "Page List" sub-tab to view a list of all pages and their IDs. You can acquire the ID of a module by navigating to your website's administrator panel followed by selecting the "Minecraft" tab. You will see an additional column reading "Server ID" for each server on your website. You can enable developer mode on your Enjin account in order to display useful information such as IDs throughout the Enjin platform in addition to gaining access to various advanced features. We strongly recommend that you enable this feature if you're going to be working with the Enjin API. You can enable developer mode by navigating to this link and checking the option "Enable Developer Mode". html += "<br>Access: <b>" + response.result.registered + "</b>"